Does Your Teenage Driver Know What To Do In An Accident? Having a teenage driver can make you extremely nervous as it is, let alone thinking about them getting into an accident. As a parent, you want to make sure that your teen driver is prepared for every driving experience they could face, including accidents. While you hope that your child will always remain safe on the road, it is possible that they will one day get into a car accident. This is why it’s extremely important to teach them what to do so that they remain safe. Make sure that you teach your child exactly what to do in an accident by talking to them about the following information or even role playing. Teach your child that the minute they get into an accident, they need to call 911. Tell them to stay in the car and call 911 before getting out to check the damage or to check the other people in the car. If the accident was your teen’s fault, the other driver may be upset and start yelling or even threatening your child. Getting the police on scene as soon as possible by calling 911 will ensure that the situation is handled with control and that all the correct paperwork is generated. Get out of harm’s way. If the accident was severe and your child notices that their car is on fire, that gas is leaking or that their car is dangling over a bridge, they need to get out of the vehicle if possible. While your teen will want to stay in the car, it’s important that they remove themselves from the vehicle if staying in the vehicle puts them in immediate danger. They should also try to help anyone else that may be in their car too. Provide information to the police. 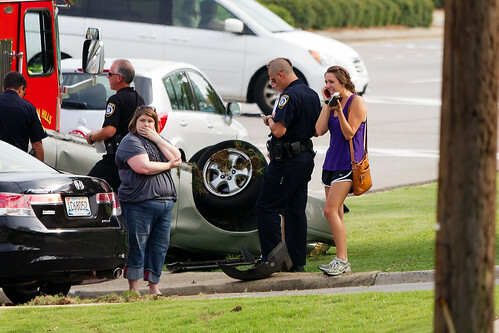 When the police arrive, they will check out the scene of the accident and require that an accident report be filed. Your teen will need to provide the police officer with their basic information, such as name and phone number, as well as their insurance information. Your teen will be given a police report to keep for their records and to give to their insurance company in order to file a claim, if necessary. Your teen should never leave the scene of an accident until the police give them permission and provide them with a copy of the police report. If your teen’s car is still drivable, your teen will be able to go about their business as usual. If their car is extremely damaged, they will need to have their car towed, and they will either get a ride to the police department from a police officer or they can call you for a ride home. If your teen was hurt, there may be an ambulance on scene to provide them with first aid. If their wounds were more severe, your teen may be taken to the hospital. Tell your child that even if they don’t feel as if they were hurt, they should always get checked by a medical professional. Oftentimes injuries from accidents don’t appear right away, and it’s possible that your child may feel fine but feel awful and have bruising a few days later. Plus, doctors can also check for internal damage, and it’s important to note this information in police reports. Caleb Grant lives in Boston with his wife and 16 year old son. He works in an auto shop and has been blogging about safety tips for teen drivers.